Text Analysis microservices – built on SAP HANA – allow you to process unstructured textual content from a variety of document formats and transform it into structured data without the liability or concern for hardware infrastructure, installation, or maintenance. This information discovery service facilitates enterprise decision-making processes by extending the value of your business intelligence investments that report off structured data. You can find these analytical microservices on the SAP Hybris as a Service (YaaS) Market and incorporate them into whichever technology platform you use. Application developers benefit from the range of text processing functionality, from tokenization and stemming to semantic analysis in the form of entity and fact extraction. Establish full-text indexing using natural-language capabilities based on linguistic analysis. Classify predefined entity types and understand relationships between one or more entities, or some sort of state involving an entity through fact extraction. SAP Text Analysis microservices on YaaS provide a specific set of capabilities that are exposed via HTTP REST APIs that allow the services to be used in applications. What SAP Text Analysis microservices are offered? Text Analysis Linguistic Analysis: language identification plus tokenization, stemming, part-of-speech tagging and noun group (concept) extraction for a text file or block of text. For more information, review ‘Details’. Text Analysis Entity Extraction: submit a text file or block of text and pinpoint the “who”, “what”, “where”, “when” and “how much” (e.g. people, products, addresses, dates, currencies, etc.) by filtering out all the noise in unstructured text. For more information, review ‘Details’. Text Analysis Fact Extraction: Finds complex patterns, activities, events, and relationships among entities such as a sentiment towards a topic for a text file or block of text. Entities by themselves only show that they are present in the text corpora but facts provide information on how these entities are related. For more information, review ‘Details’. Why SAP Hybris as a Service (YaaS)? YaaS is a microservices platform that allows everyone to develop, extend, sell and consume microservices that make rich application development simpler. The platform is open so organizations can have the option to develop in a wide variety of programming languages and is reachable via multiple clouds including SAP HANA Cloud Platform (HCP). YaaS Market is the online marketplace for microservices-based application programming interfaces (APIs) and apps, where customers subscribe to microservices such as SAP Text Analysis. Where is the YaaS Market available? As commercial offerings (i.e. services for production) they are currently offered in the United States and Germany. UK and Switzerland will soon follow with other countries online for 2017. However, it’s possible to build proof of concepts outside of these territories. If you are not a licensed SAP customer, it’s not a problem. Any user can sign a standard contract and billing is via credit card on a monthly basis. Services are priced based on usage – you only get billed for the bandwidth of information sent, i.e. the volume of input data processed. Cancel your subscription at any time. SAP Text Analysis microservices on YaaS have a free tier under the Worldwide (Beta). You can use a bundle of services (package) up to 1 GB of bandwidth each month in non-production use cases. 1. Sign In under My Account on YaaS. If not a member, you will need to Register under My Account on YaaS. It is free. 2. Go to the YaaS Market and scroll down until you see the three gold SAP Text Analysis packages. 3. Click on the package “Text Analysis Fact Extraction”. 4. Click on the service “ta-sentiments”. 5. Click on the yellow “API CONSOLE” button. 6. Click on the green “POST” button. 7. Click on the green “Try It” tab. 9. Paste your authorization token from the step before into the Authorization field. Remark: Make sure that the “Bearer” prefix is not lost. 10. Change the languageCodes to “en”. 11. Click on “application/octet-stream” to use automatic format detection. 13. Click on the green “POST” button. 14. 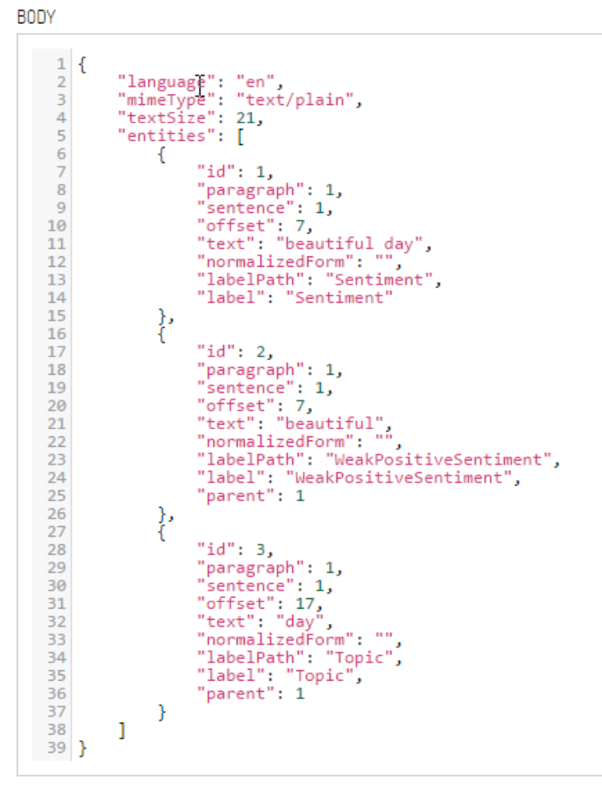 Scroll down to see the JSON response. 15. Celebrate your first SAP Text Analysis microservice experience on YaaS! Customers are supported via a low-touch support model by posting to the YaaS Expert Forum. Services delivered via YaaS Market are not covered by SAP Enterprise Support. In summary: Text Analytics with SAP HANA 1 is for free. And with SAP HANA 2 you have to pay for it? Got it! Thank you for the clarification Anthony. Glad you enjoyed the openSAP course Text Analytics with SAP HANA Platform. Yes, both Text Analysis and Text Mining capabilities are still available on the upcoming SAP HANA 2.0 for on-premise. In fact, there are new and improved features with HANA 2.0 such as SAP Web IDE supports developing custom dictionaries and rules and Voice of the Customer (sentiment analysis) extended to Arabic just to name a few. 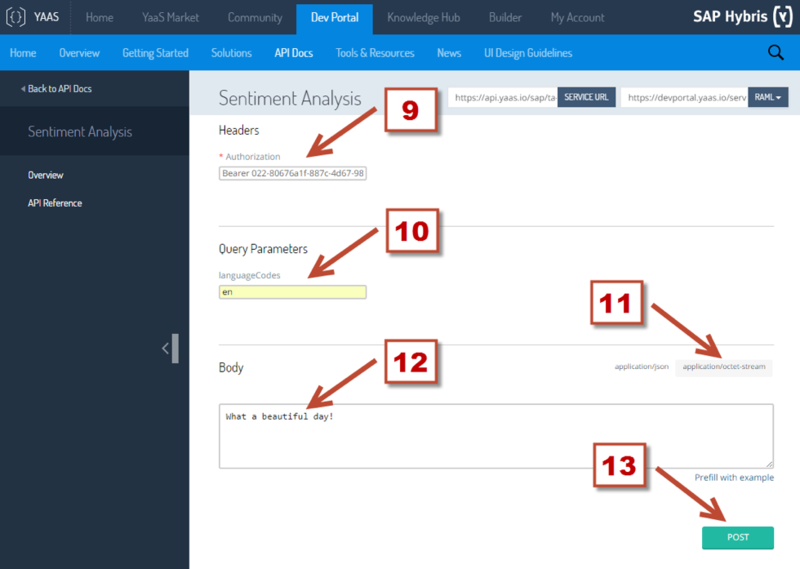 By the way, did you know that Text Analysis and Text Mining features are included with SAP HANA, express edition too? Yes, you can play with TA & TM in the streamlined version of HANA that runs on laptops and other resource-constrained hosts for free up to 32G of memory use. Went through the OpenSAP course. However, most of the course seem to be based on ppt, and no live demo is shown anywhere throughout the course..which surprises me. Is there any video that shows end to end usage of text analytics on HANA, be it on express edition or on the Onpremise edition of HANA 2..
A picture plays thousand words, and a video plays thousand pictures.. and human brain is too quick in following a step by step guidance/walk through by means of a video, incase its possible- as I know you have come a long way to make people use this technology and trust me- a simple video showing a quick walk through of the technology with some real time scenarios would go straight into users brains- easily.. Appreciate if you could point me to such a video. Thanks for the feedback on the self-paced version of the openSAP course Text Analytics with SAP HANA Platform. This first version of the MOOC (Massive Open Online Course) was created over a year ago when both SAP HANA 2 and SAP HANA, express edition did not exist. Yes, the videos are mostly ppt-based and seldom show live demos. Note: Week 4 has a few system demos. 😉 Displaying the results in slides was a conscious choice with the hope students would quickly absorb the details; whereby minimizing the duration of the videos. More importantly, while the MOOC was running, HANA systems were made available with accompanying hands-on exercises so students could discover first hand. Please be aware we will be updating and re-running the course this summer based on the new or improved features in HANA 2, new delivery mechanisms such as HANA express & YaaS, and user feedback from the initial course such as yours.